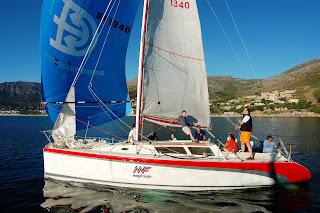 Megafreight, our local Simonis 35, enjoying the sun rather than the wind in Hout Bay! The Simonis 35 is another amazing boat. Unlike many of the others, I can't find much detail on it, and I don't know too much about the designer, Alex Simonis either. If anyone, Alex included, would like to add to this or correct things please do! The South african connection is of course Simonis - who has worked here for many years and runs an office from Milnerton - although the Simonis-Voogd head office is now in the Netherlands. Simonis, or Simonis-Voogd, has designed a lot of very successful boats for the SA market over the years. 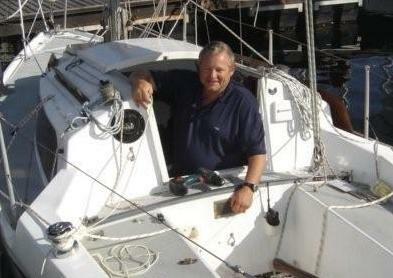 I have sailed with and against this boat for many years at HBYC. It wins 60% of all club races, in a small but actually quite competitive fleet. Admittedly it is crewed consistently well and is well maintained - but this seems to be the norm for these boats. This one competes well in most local regattas and recently won the FBYC Spring Regatta on Club Handicap. "Our Diane" has won the Governors Cup three times (if memory serves), and Wallbanger is another good example. They are all very competitive and stand out in the local racing scene - even though the design is now about 20 years old (I would guess - I am not sure). Simonis is known for competitive yachts. Even his "cruisers" are really racers with nice upholstery if you ask me. Think of the Pacers/Leisure 42s/Fast 42s. Nicorette and Broomstick came from his pen. I seem to think Simonis was asked to draw the next SA Americas Cup boat (if we get there), and now Simonis-Voogd also design the Dehler Range. There are many others. They are all fast! By nature, performance yachts are extreme. They have deep bulb keels (or canting keels), they have tall tapering multi-spreader (carbon) masts, spectra lines, fancy sails, light hulls and light materials. They cost a fair bit. And the designers job is to "sail as close to the wind" as he can with these materials without stuff breaking too often and placing the lives of the crew at risk. In fairness, a lot of responsibility lies with the skipper and boatbuilder too. Margins for error are quite slim - specifically the risk of breaking the mast or losing the keel. And then there is the challenge of achieving a good IRC rating. The Simonis 35 does this all rather well in a conventional way. Its a fine looking boat, but also quite a good sea boat. Don't get me wrong I would not think of cruising on one of these - but she is pretty safe on the sea - and Hout Bay is a good place to prove it. I know of many ocean crossings made by these boats - around SA, but also to St Helena and Rio - and back! - all without incident, and all at great speed. 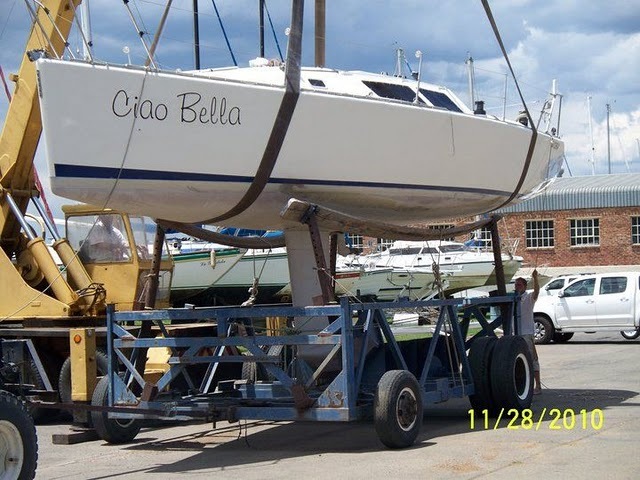 See the flattish underbody, high-aspect bulb keel, fine bow and long waterline. As far as I know, all Simonis 35s were factory built - actually very well built - though I don't know who built them. The smallish engine is mounted midships just aft of the keel, great for dynamics and not too intrusive inside as it happens. Whilst great performers - in fact they aren't too expensive or high-tech. They are great and fairly affordable racers - at just the right size. I havent seen anything much faster in this configuration - except out and out sports boats . . . the Mount Gay 30 (Simonis or Dix), or Pacer 37 comes to mind, also from Simonis. 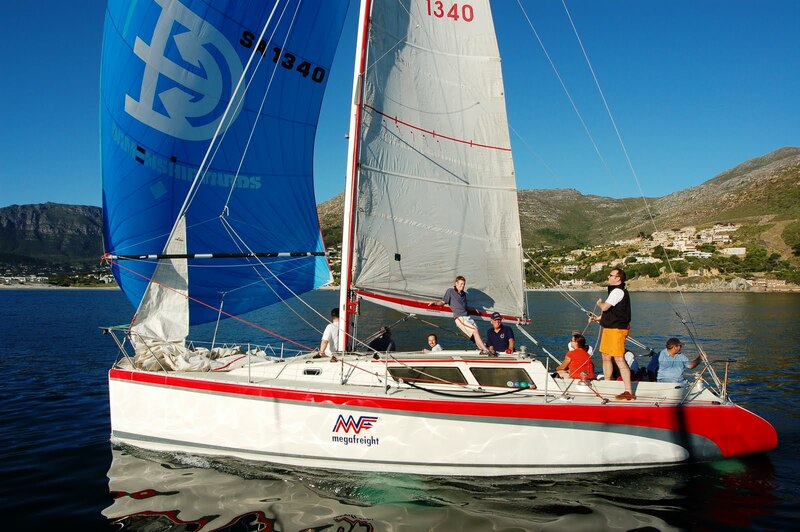 Simonis 35s operate off a RCYC PHRF Club Handicap of around 1.08 - 1.10 depending on sail configuration. Compare with a refernce boat such as the L34 - at 1.015 - itself a great performance boat - it indicates the performance nature of the Simonis 35. Having sailed against several of them - my impression is that their real strength is to windward, and with a good few pounds on the weather rail. Downwind they move as a 35' should - but upwind and round the cans they really come into their own. They seem to make their own wind in light airs, and are comfortable in windpseeds of up to about 22 knots - after that they can be quite a handful and need to be properly reefed if going upwind. Megafreight does 8 knots on jib alone when it really blows. . . .
Megafreight showing her mettle on a blustery Hout Bay day. 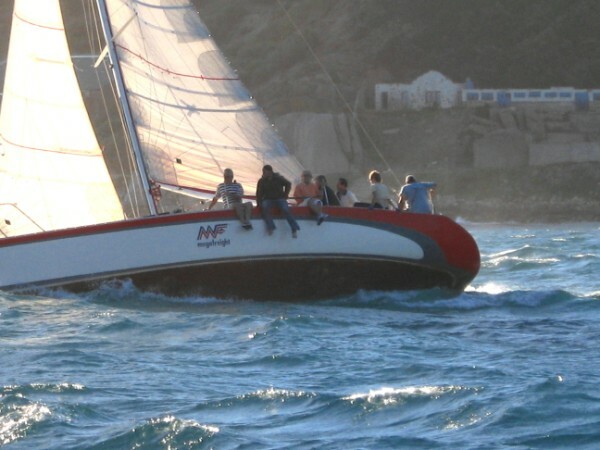 On a moderate budget, the Simonis 35 should be on your list of good club racers in South Africa - others might include a Farr38/40, the DiDi 34 or 38 (or 40 now), Mount Gay 30, Mumm-36, L-34, depending which class you want to be in. 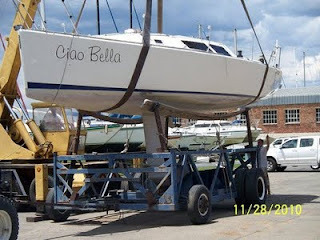 The picture here is of Flying Cloud - a Hout Bay Resident boat. This is also the Dix 43 with which I am most familiar - although most are built in steel and a few in aluminium. I make no apologies for the glowing references to most of the boats in this blog - nor the qualities of the designers - they are here because they are my favourites, or at least very interesting. This boat is a brilliant cruising design. While researching for this posting - I was interested to see it is the personal choice of at least two professional builders - including also Robert Christinger (Alumar Yachts) - who makes very detailed kits for them. The designer - Dudley Dix - is also arguably the best "design to build" man in the game, with very practical and sensible designs, all based on contemporary class-leading concepts. Kits are vailable in Steel and Aluminium as far as I know - details on http://www.dixdesign.com/. The "Dix Range" within Dudley's portfolio represent the most sensible, balanced range of cruisers you will find anywhere. The Shearwaters (modern classics oozing style), and the Hout Bays (corinthian classics), are also in fact modern designs but offer traditional styling and rigs if one prefers. The "Dix" range however is purely contemporary - they have the fewest compromises to be the "thinking man's cruiser" in my words. If someone were to ask me to chose my ideal cruising yacht in 10 seconds this would be it from the yachts I know . . . other more informed folk have come to the same conclusion after much more thought but there you are. The Dix range includes four versions of the Dix 43 - the original aft-cockpit version, the standard centre cockpit version, the pilothouse version, and now also an aft-cockpit version with a hard dodger and trunk-cabin. I honestly don't know which is best - or even how to argue the case for any one of them - they are all great. Centre cockpit is great on a boat this size - I have been in this one and it has all the advantages of a centre cockpit without the usual drawbacks below - but the Pilothouse would be great as well - and the aft cockpit with hard dodger might have the best of them all? (I haven't seen this one in the flesh but surely it has the potential to have the largest cabin . . .). You can build from Steel (most of them are), or Aluminium. The one in the top pic was built of ply (radiius chine) - and is extremely successful - but is not a standard offer to my knowledge. All Dudley's cruising designs have modern underbodies and moderate keels. The hulls are moderate in section and beam, but have relatively long waterline running up to the fine bow. The Dix 43 has a semi-balanced rudder well aft on a partial skeg.﻿ All the ratios are moderate and balanced, and the design makes use of all contemporary thinking to make her fast, sea-kindly, spacious and safe - without being expensive or extreme. As with most Dix designs, the engine and tankage is very central, leaving the ends nice and buoyant, with good engine access. These boats have great "open ocean cred" to coin a phrase - they are good for Cape Waters and the 40s if you like. They have powerful keels and efficient rigs, making them very able sailing upwind. These are not just boats for the Med or the Latitudes . . . all comments for the Shearwater 39's sailing ability apply here too - even more so, as it is a slightly bigger boat. The space inside is vast. The broad stern, generous freeboard and ample windows make it light and large without the dymamic drawbacks of todays "floating charter caravans". Both the centre cockpit version as well as the Pilot House version have extensive windows and support good views from the saloon. Layouts are conventional but larger than usual - and it certainly feels like a boat you would easily live in. Cockpit is safe and spacious. How does it compare with the Shearwaters and the Hout Bay Range? Or the armada of mediterranean charter boats? Well - the Hout-Bays, the Shearwaters and the Dix's have very similar hull philosophies. The differences are primarily in style and choice of rig. The Dix range makes least compromises. The Shearwaters look the best. And the Hout Bays are theoretically the simplest, cheapest, most traditional, and maybe the most spacious . . . although a bit slower, but not too much . . . The "med boats" now also have leading designers, factory finishes, good accommodation, but they still aren't tough enough for around here, and don't sail quite as well as they should. Even their tying up cleats are woefully inadequate for Hout Bay (I have personal experience of these). Certainly they lack soul, and bullet-proof is a term I wouldn't put in the same sentence. I'd take a Dix 43 over one of them any day at all . . . . Does a Dix 43 have any drawbacks? None that come to mind if you want a cruiser with great performance and safety. Its not a buoy-racer - but if you entered the Cape to Rio you'd be right up with the front-runners and likely win the cruising division. Sailing back you might get back first . . . and still be dry. . . my only gripe is the one I want is listed beyond my budget . . . ! Another very interesting design on the same philosophy is the Dix 38. See http://www.dixdesign.com/dix43.htm for Dudley's website info on this design.